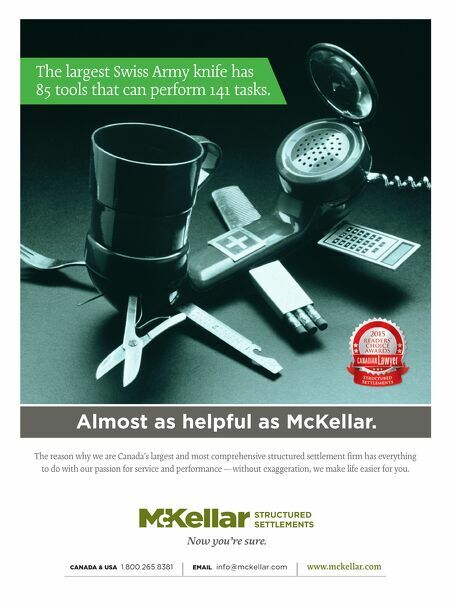 CANADA & USA 1.800.265.8381 | EMAIL info@mckellar.com | www.mckellar.com The reason why we are Canada's largest and most comprehensive structured settlement firm has everything to do with our passion for service and performance — without exaggeration, we make life easier for you. The largest Swiss Army knife has 85 tools that can perform 141 tasks. Almost as helpful as McKellar.